I don’t drink much gin, but I love how it tastes in this Nimbu Pani Gin Fizz. I took flavors of my childhood in India and turned them into an adult drink, one that I hope Indians and non-Indians alike will enjoy. Nimbu pani itself can be an acquired taste for non-Indians, with its salty and smokey flavors, but it is much easier to get to know when you add ginger beer & gin. I imagine this drink to be something the grown-ups might have had, when they were serving nimbu pani to us kids in India. In fact if you lined up all my Indian aunties and asked them to order one drink at the bar, it would be a Gin & Tonic 🙂 It’s one of those leftover legacies of the British Raj. All of a sudden, gin has had a popular, artisanal revival, and no one thinks Gin & Tonics are just what the aunties drink. No matter how trendy it is, I still can’t get myself to have drinks with tonic water. Tonic water has left a bitter taste in my mouth & mind – it reminds me of the identical flavor of heaps of quinine tablets I had to swallow. As a kid growing up in India, quinine tablets were essential, especially after I almost died of malaria. So no tonic for me, but I was able to find a different way to drink gin. Indian Summers is a new show about the British Empire in India, starting on PBS Masterpiece on Sunday, September 27th at 9pm. I don’t think it’s “the new Downton Abbey,” but I do think it’s going to be big, with multiple series. I’ve previewed the first season and the actors and the filming locations in Penang, Malaysia are wonderful. I especially loved seeing some of the old desi actors I grew up watching, alongside aspiring new talent. The flaws I found in the show are purely cosmetic. Having been to Shimla twice in summer, and speaking multiple Indian languages myself, I had minor issues with the topography and linguistics. Shimla is not actually so tropical, and some pronunciations were off, from characters who should have known better. Besides that though, the first series is beautiful and I think, much needed in America. I am thrilled to see something so mainstream about where I come from. There just aren’t shows about India on American television. Maybe I’ll have to do less explaining to Americans about our cultural nuances, why there are so many British influences on Indian culture, and vice versa. The show’s focus on racism at all levels, especially Ango-Indians and prejudices against people of mixed heritage, was refreshing. When you learn the history of a culture, you can appreciate it better. I hope Indian Summers will help the average American relate to the average Indian, a little bit more. To celebrate Indian Summers on Masterpiece, I developed a new recipe for an Anglo-Indian drink: the Nimbu Pani Gin Fizz, AKA “The Indian Summer.” Find my cocktail recipe along with a little drink history published at local PBS station’s website, KCTS 9.org serving Seattle and Vancouver. This mixed drink combines favorite flavors from both the British and Indian memories of the summer of 1932, when the first season is set for Indian Summers on Masterpiece. Nimbu pani means “lime water” in Hindi, and it is the most familiar summer drink in India aside from perhaps lassi or chai. Summers in India are quite sweltering, and nimbu pani restores essential electrolytes quickly and cheaply. It is not your regular lime-ade, rather it is both sweet & salty, with a sulfurous rock salt and bits of toasted cumin. Most of India drinks nimbu pani without alcohol or soda, and without straining the spices. It is generally finished with added water and sugar to-taste. Nimbu pani also tastes great when mixed with both gin and ginger beer. The British had brewed ginger beer for more than a century before Indian Summers is set, and took it with them across the world. Gin, meanwhile was the poison of choice for soldiers in the British Empire. The popular drink gin & tonic was born in India. Tonic water contains quinine, which was essential to survival in tropical places like India because it helps prevent and treat malaria. To mask the bitter taste of quinine, British soldiers started mixing tonic water with gin. The everyday Indian’s summer drink and the elixir of the British Raj combine for a sort of an Ango-Indian gimlet or a nimbu pani fizz. Ginger beer helps make the marriage in my recipe, but if the spice is too much for you then club soda can do as well. I like a lot of flavor and recommend maple syrup, but you may rather use simple syrup. Adjust ingredients to your taste. There is no one nimbu pani recipe in India, and there will not be one Indian Summer for all tastes. Serve with one or more episodes of Indian Summers on Masterpiece and enjoy, while listening for references to nimbu pani, gimlet, and the many mergers of British and Indian characters, culture and history. Mix lime juice, maple syrup, cumin, kala namak and gin. Strain and pour the mixture into two chilled cocktail glasses. Top it off with cold ginger beer. 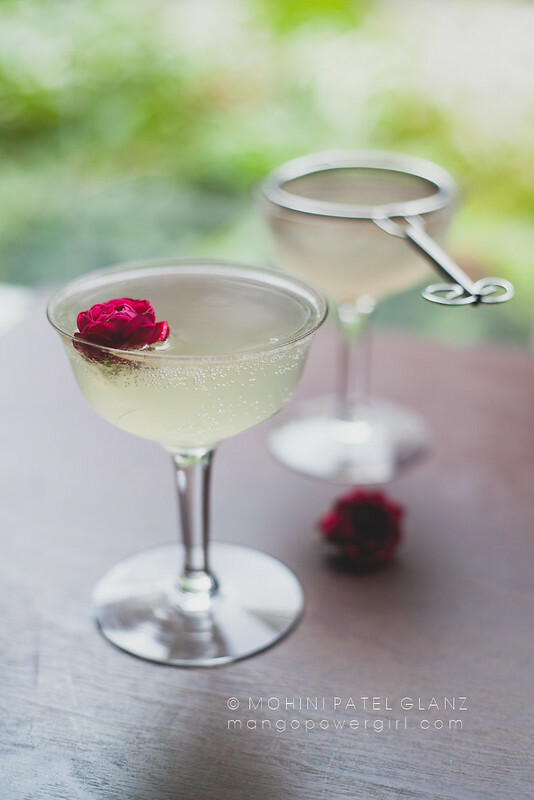 Garnish with an edible flower like miniature roses and serve immediately.